Off Balance is a debilitating effect that temporarily stuns an enemy, which can be caused by various attacks, but most commonly by Blocking a melee Heavy Attack. You can get out of it with a Break Free action. When an enemy is Off Balance, they can be knocked down with a Heavy Attack. Off Balance will last 5 seconds regardless of the source. Lava Whip (Ardent Flame) Single Target 2700 Magicka Target must be stunned or immobilized first. Flame Lash (morph) If target is already Off Balance, does more damage and heals you. Deep Breath (Draconic Power) Nearby Enemies 4320 Magicka Target must be interrupted while spellcasting. Shattering Rocks (Earthen Heart) Single Target 3510 Magicka Occurs after 20 sec., 50% chance. Veiled Strike (Shadow) Single Target 2700 Magicka Must attack from stealth. 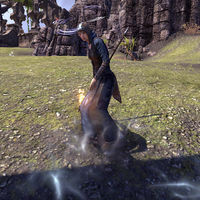 Toppling Charge (Aedric Spear) Single Target 3510 Magicka Target must be interrupted while spellcasting. Venom Arrow (Bow) Single Target 2430 Stamina Target must be interrupted while spellcasting. Crushing Shock (Destruction Staff) Single Target 2700 Magicka Target must be interrupted while spellcasting. Pounce (Werewolf) Nearby Targets 4050 Stamina Also stuns targets. Roar (Werewolf) Nearby Targets 4163 Stamina Also inflicts Fear. The Tactician perk from 120 points in The Atronach will set enemies Off Balance when you perform a Roll Dodge near them. The Exploiter perk from 75 points in The Ritual will increase your damage done against Off Balanced enemies. Bosses and other CC immune enemies will not get set off balance if their heavy attacks are blocked or their spells interrupted. The only way to apply Off Balance to boss type enemies is to damage them with the lightning version of Wall of Elements while they are Concussed. Bosses will now gain 15 seconds of Off Balance immunity after Off Balance ends. This page was last modified on 4 February 2018, at 16:31.